I’m calling this recipe “Crowdsourced” Homemade Blueberry Granola because I basically sourced this recipe from my friend Julie’s Facebook post and iterated upon that based on what ingredients I had available in the pantry. This granola is super easy to make, requiring little in the ways of technique or obscure ingredients, which is awesome for an impatient, no-fuss cook like me! As the granola cools, it forms chunky, crunchy bits that are impressively on par with the texture of many store bought brands like Bear Naked or Kind. Serve over yogurt for a light and filling breakfast, or eat on its own for some midday fuel. Combine the rolled oats, cinnamon and salt in a bowl. Combine and mix the wet ingredients (coconut oil, honey and vanilla) in a separate bowl. Pour the wet ingredients into the dry ingredients bowl and mix everything well with your hands. Add the pumpkin seeds and dried fruits into the mixture, make sure they are evenly distributed throughout. Preheat the oven to 220 degrees. 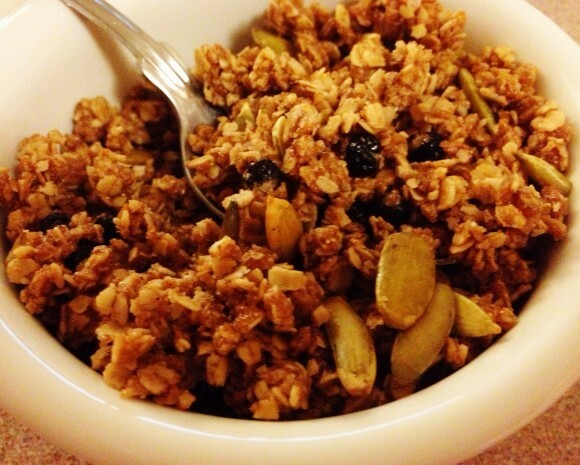 Spread the granola mixture into a thin layer over a baking sheet. Bake for 20 minutes, take out the sheet and mix the granola around, and then bake for another 20 minutes at the same temperature. Let it cool for 5 minutes. Store in a large, airtight container. Yields a lot of servings (~6-8 individual servings). 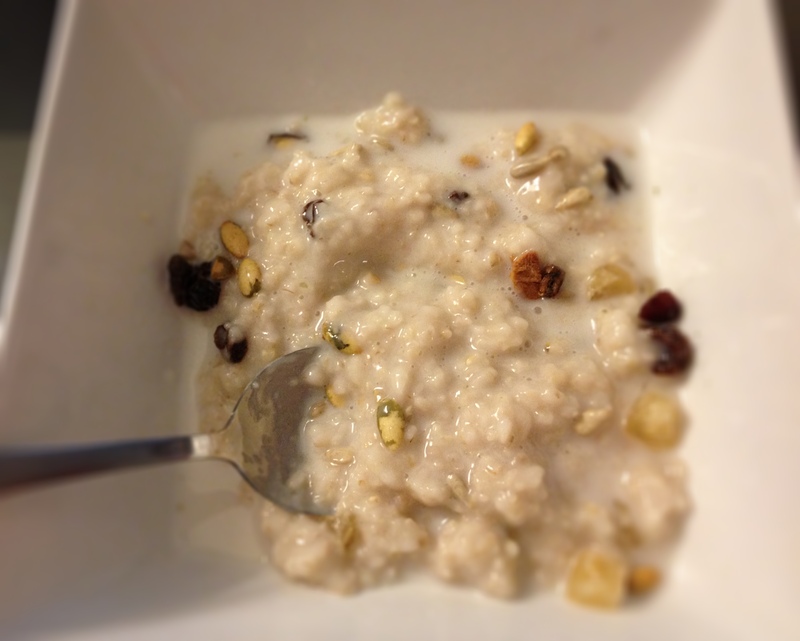 Making Oatmeal in a Rice Cooker–It Works! There’s nothing like a good bowl of oatmeal to start off my day. But how do you create a perfect batch of steel cut oats like you get at a restaurant without slaving over a stove for hours? 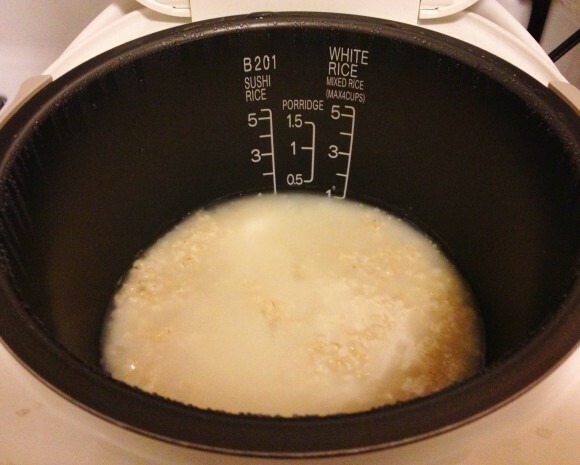 Solution – use your rice cooker! 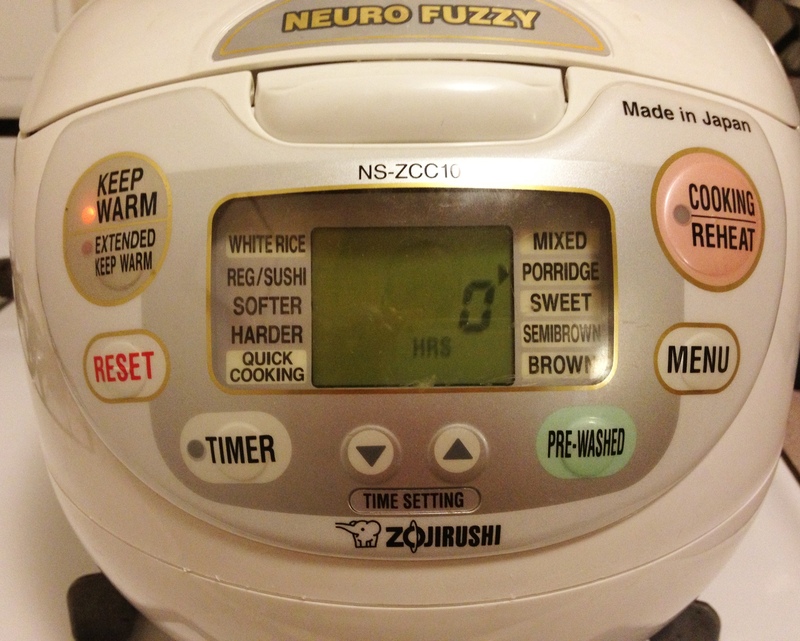 If you have one of those awesome high tech Zojirushi rice cookers with settings for porridge, then cooking restaurant-quality steel cut oats is a cinch–just set it and forget it! You should use regular steel cut oats for this method, although I found that the 5-minute steel cut oats from McCann’s worked just as well. 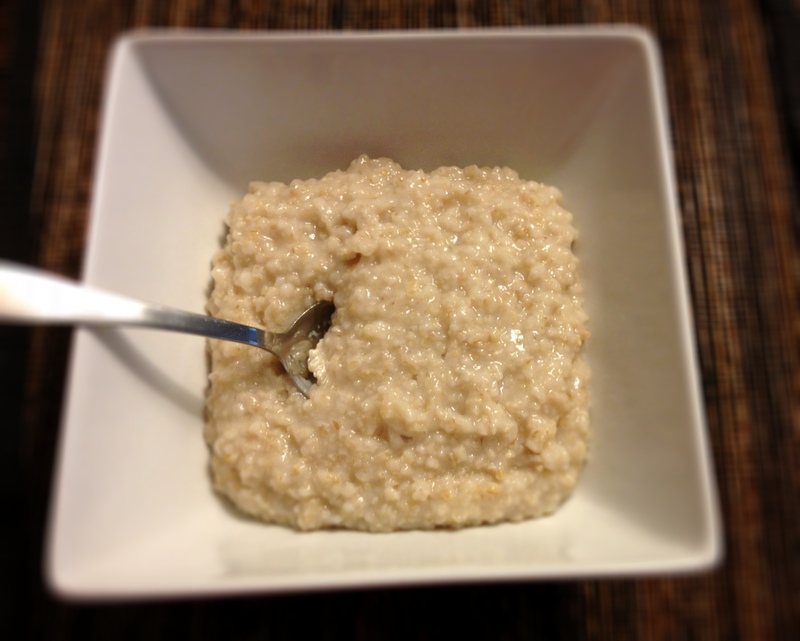 For every single serving of steel cut oats, which is 1/4 cup dry, add 1 cup of water. Choose the “porridge” setting and in about 45 minutes your oatmeal should be ready. Don’t worry if you open the lid and the oatmeal looks watery. It’s ready, you just have to mix everything together, and then your oatmeal will look like this! it’ll look watery, but don’t worry, it’s ready. just mix. mix it up–it’s all good! Add some almond milk, dried fruits, nuts or whatever toppings you like, and you’ll have a bowl of oatmeal totally on par with any high end artisanal restaurant’s version! 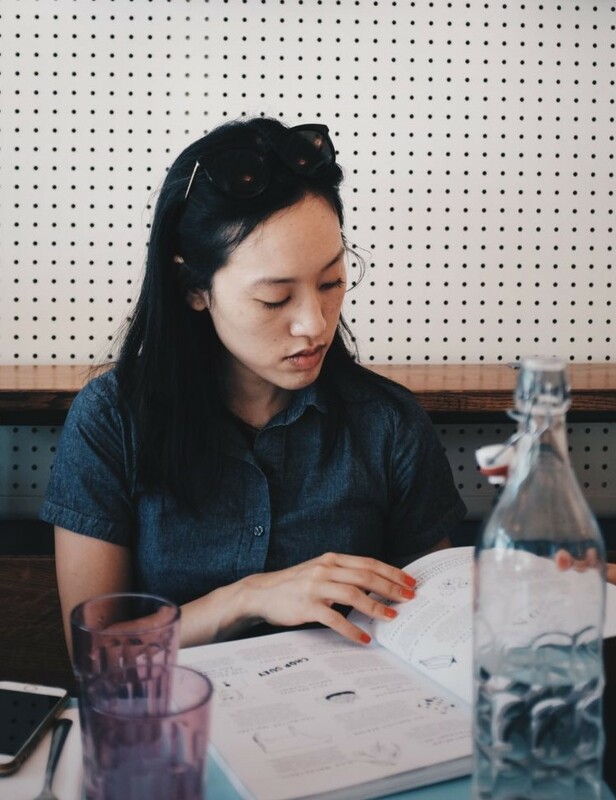 Kaffe 1668 is a very serious-minded cafe located in Tribeca that brews single origin, fair trade coffee, but they also offer a surprisingly good food menu of high quality sandwiches, soups and salads. 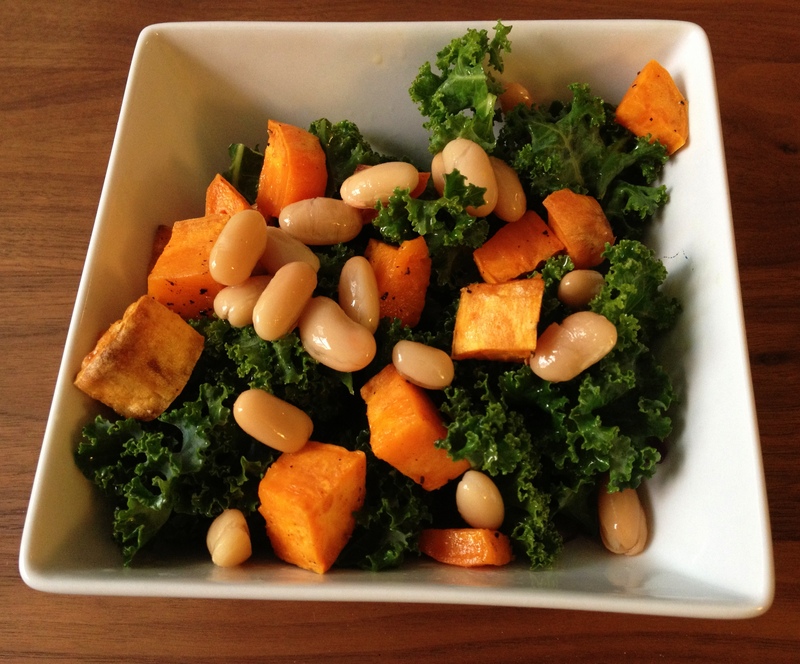 My favorite lunch item there was a hearty and delicious sweet potato, kale and bean salad. Now that I no longer work in Tribeca, and Kaffe 1668 doesn’t have a location near the East Village, I decided to recreate it at home with surprisingly successful results! Preheat the oven to 375 degrees. Peel the sweet potatoes and dice into half inch cubes. Lightly coat the diced sweet potatoes in olive oil (~1-2 tablespoons) and season generously with salt and pepper. Place the sweet potatoes in an oven safe pan and roast for 30 minutes. Once finished, set aside and cool for 5 minutes. Wash the kale and tear off the curly leaves from the the stems. Dry off the leaves and set aside in a large bowl. Season the leaves with olive oil and freshly squeezed juice from the lemon (about 2 tablespoons olive oil and juice from half of the lemon). Feel free to season to taste with more lemon juice and salt. Add the red onions, half of the can of cannellini beans and the sweet potatoes. Toss the salad so that everything is distributed evenly. This should yield about 3-4 servings. On a recent visit to Peel’s, I was so blown away by their delicious savory red quinoa salad that I was inspired to re-create the dish at home. I put an Asian spin on the recipe by adding some soy sauce and sesame oil to the ingredients. The end result is a light and tasty salad with an umami flair that will satiate your cravings for a hearty vegetarian option. Heat the oven to 450. Lightly coat the diced squash in olive oil (~1-2 tablespoons) and season generously with salt and pepper. Toss all the ingredients and mix in a bowl with your hands or a spoon so that the squash is well-coated. Place the squash in an oven safe pan and roast for 40 minutes or until the squash pieces can be easily pierced with a fork. Be sure to stir the pieces about every 10 minutes while roasting so that they are cooked evenly. Wash the quinoa with a very, very fine strainer or sieve. A regular strainer used for pasta or rice will not work, as the holes are too big and the quinoa will fall through. Place the clean quinoa in a pot with 2 cups of water. Bring to a boil, and once it comes to a boil, reduce the heat so that the water comes to a simmer. (Simmer means there’s still some movement like water currents but they don’t actually break into bubbles). Let the quinoa simmer for about 12 minutes or until the quinoa has absorbed all the water. Stir throughout so that the quinoa doesn’t stick to the pan. Transfer the cooked quinoa when ready to a new bowl. Combine the dijon mustard, olive oil, maple syrup and apple cider vinegar and stir together into a dressing. 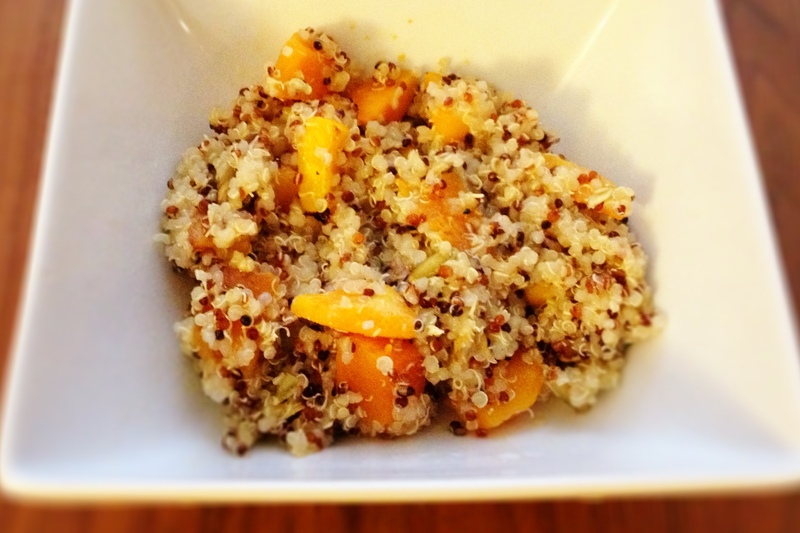 In a separate bowl, combine the cooked quinoa and squash. Pour the dressing over the combined quinoa and squash, and mix throughout so that the dressing is distributed evenly. Add the soy sauce, sesame oil and pumpkin seeds and distribute evenly as well. You can add more soy sauce if you would like to season to taste. Serve the salad warm. This should yield about 4 servings.